As the colder weather rolls in, I start to remember the lonely winter days being spent in isolation. Those days, there I was- Trapped. Alone. Miserable. Everyday appeared to be the same: it was too cold to step outside of the home, for the winter wind was fierce and violently struck you in the face. The road conditions were terrible, resulting in me having anxiety just thinking about driving my SUV anywhere with my young children in it. The fact is, that I’m not alone. I know there are other mothers out there that have felt the same way as I have. 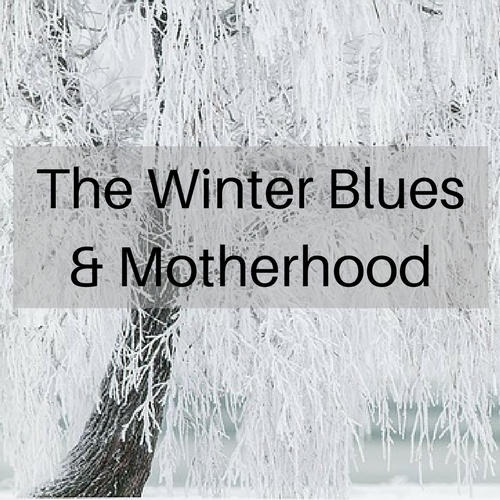 The winter blues are a real thing, and when you’re a mother, this seasonal disorder hits you even harder. As a mother, you feel trapped inside your home, with babies that don’t seem to settle, toddlers throwing massive tantrums, and older children continuously arguing with each other. The lack of sunlight adds to the darkness of your mind and you crave just a tiny speck of light to shine into your day. But, it never seems to. It gets lonely. You become hopeless. Get up and find that light yourself! During the last two winters, I did the latter and it made a huge difference in my overall mood! I opened the blinds and pulled back the curtains in my home to make my place feel brighter. I also made sure to connect with friends, whether it was through a phone call or through social media. Just having a friend I could chat with, made me feel a lot better! Implementing a healthier diet added to giving me that boost I needed , as did some light exercise. I tried to leave the house. This was difficult for me, but once a week I would force myself to leave the home and go to the library, recreation centre, an indoor attraction, or a coffee shop. Although it was a struggle to leave the home, I always felt better once I reached my destination. Finally, each night I did one special thing just for myself- eat some chocolate, read a book or a magazine, give myself a facial, drink some tea, and so on. My dear mamas, I hope this gives you some inspiration to help you find that light you are searching for this winter! I totally know what you mean! I think it’s really important to connect with other adults and have people to talk to! I always tell new Moms to connect with other moms whic understand what you are going through. I totally agree with you. When I moved from Dubai, I wasn’t able to understand what makes me so down at night lol apparently it was the sun setting so soon. But you can always do fun things at night like light up a candle, fireplace, have warm coffee or hot chocolate, watch something fun on tv or have a good book to read. Very true…you have a choice…. I am not a fan of the cold weather…and if it snows am not a fan of driving in it but I now refuge to be held hostage by the cold weather and we still get out and about. I live in the GCC where summers hit 45-50deg celsius and the coldest I have experienced in my life is 16! Ans I still hate winters. I cannot even imagine it being as cold as canada! We were in Spain recently where it was 21 deg C; and i hated the weather! All the best to you momma! Yes you can get info a rut! Staying in those pajamas might feel like a good idea but we end up feeling depressed …. I liked your comment get up & find that light! So true, help begins with ourselves! Winter blues is definitely a real thing that a lot of people suffer from. i agree, if you know you’re likely to suffer this winter, try to do something proactive about it. I always advise people to go for more walks in the winter to get fresh air – it seems weird maybe because it’s cold but it really helps! Last year was my first winter after living in California for years. Boy was I just blah, the kids were excited about the cold weather and snow but literally two minutes outside they would cry and we were back inside. This year I have made a list of play areas that are indoors so we can still get out of the house. Hopefully this will help me not to feel so down and lazy. Great ideas! Desperately needed these! Wish we lived in the same city! +Those are great ways to get rid of the winter blues. It’s horrible going out in the cold so making it brighter and more comfortable for yourself always helps. You know what is funny, we have the same thing here in Saudi…but for the summer! I get so depressed in the peak of the summer here because the weather is unbearable…forcing us to stay inside. I miss the seasons so much!